–Bionic eye is a very small photo-sensitive device that is implanted into the retinal or the visual cortex of the brain , able to converse light to electrical impulses that stimulate retina and optic neural pathway to create a preliminary image to patients who had completely lost their vision , so that they can have some sense about the environment and live without help of anybody. -The most common kind of this bionic eye is the retinal prosthesis – or retinal microchip – which is usually used in patients who suffer fromcomplete damage of the retinal photo-receptors , especially in retinitis pigmentosa and other retinal dystrophies and age related macular degeneration. -For the patient to be able to have a good visual result, the optic nerve should be somehow intact and used to have good function before the disease. So, if the patient has problems of optic nerve at birth he/she may not get a good visual outcome by the retinal prosthesis. 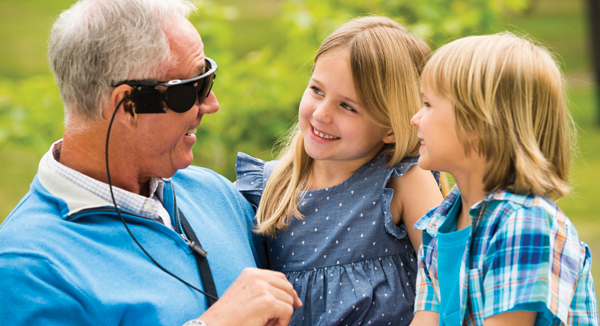 -There are many kinds of retinal prostheses. The most well known is the Argus II which had been agreed by both FDA ( the American standard) and CE (the European standard) . There is also AG Alpha IMS which had got the agreement of CE but not the FDA. 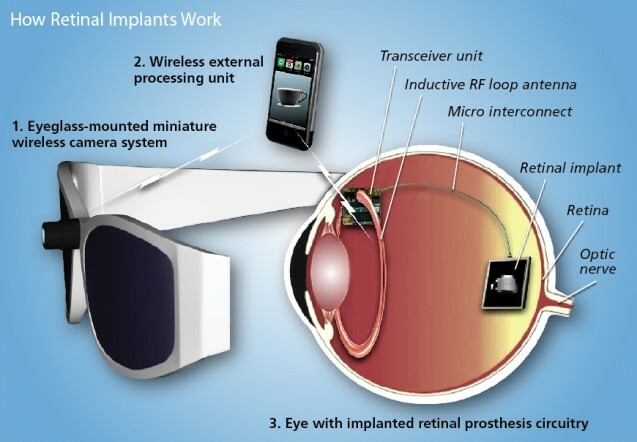 In both types, retinal prosthesis has a photo-sensitive microchip which is bound to many electrodes that can converse light to electrical impulses able to stimulate the retina and transfer these impulses to the visual cortex of the brain to get some kind of image. -The vision of patients in these bionic eyes is somehow primary but helps patients to differentiate borders of things around without details. But patient can still live without assistance of other people. -In the future with the microchips getting more advanced, the visual outcome will be much better.